14 — 2 Irwin/Mc. Graw-Hill ©The Mc. Graw-Hill Companies, Inc. , 2000 Groups, Teams and Effectiveness Group : two or more people who interact with each other to accomplish a goal. Team : group who work intensively with each other to achieve a specific common goal. All teams are groups, BUT, not all groups are teams. Teams often are difficult to form. Takes time for members to work together. Teams can improve organizational performance. 14 — 3 Irwin/Mc. Graw-Hill ©The Mc. Graw-Hill Companies, Inc. , 2000 Groups & Teams Impact Effectiveness Groups and Teams Can. . . Enhance Performance Increase Responsiveness to customer Increase Innovation Increase Motivation & Satisfaction Gaining a Competitive Advantage. Figure 14. 14 — 4 Irwin/Mc. Graw-Hill ©The Mc. 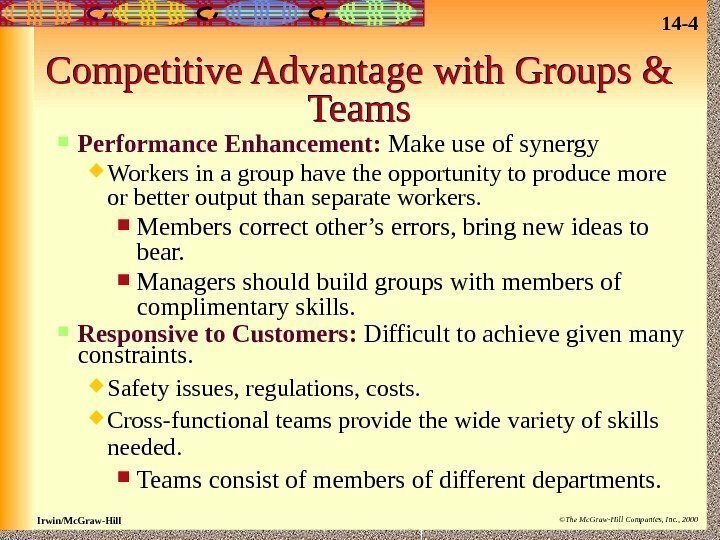 Graw-Hill Companies, Inc. , 2000 Competitive Advantage with Groups & Teams Performance Enhancement: Make use of synergy Workers in a group have the opportunity to produce more or better output than separate workers. Members correct other’s errors, bring new ideas to bear. Managers should build groups with members of complimentary skills. Responsive to Customers: Difficult to achieve given many constraints. Safety issues, regulations, costs. Cross-functional teams provide the wide variety of skills needed. Teams consist of members of different departments. 14 — 5 Irwin/Mc. Graw-Hill ©The Mc. Graw-Hill Companies, Inc. , 2000 Competitive Advantage, Cont. Innovation: individuals rarely possess the wide variety of skills needed. Team members also uncover flaws and develop new ideas. Managers should empower the team for the full innovation process. 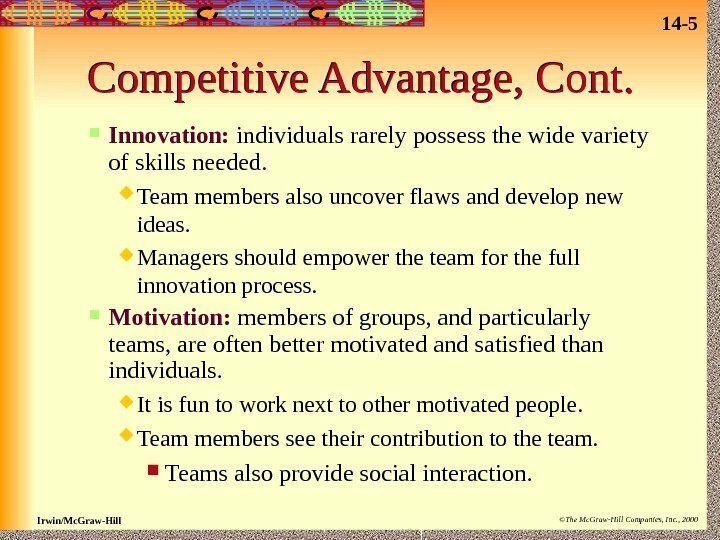 Motivation: members of groups, and particularly teams, are often better motivated and satisfied than individuals. It is fun to work next to other motivated people. Team members see their contribution to the team. Teams also provide social interaction. 14 — 6 Irwin/Mc. Graw-Hill ©The Mc. Graw-Hill Companies, Inc. , 2000 Types of Groups and Teams Cross- Functional Teams Interest Groups & Teams. 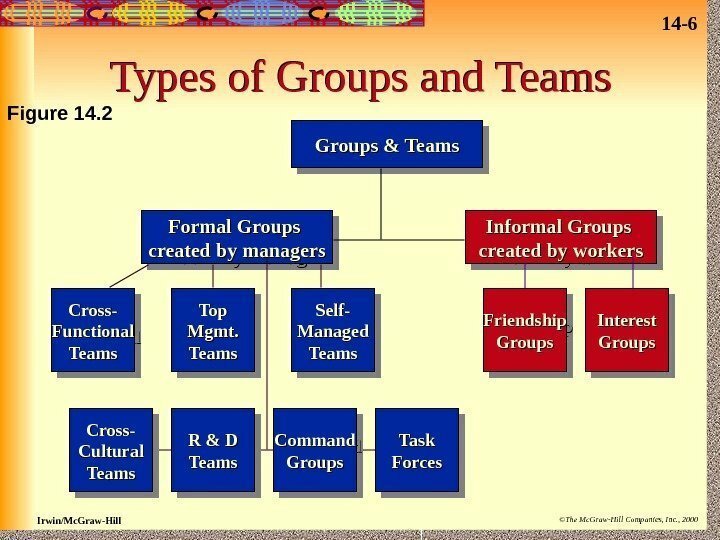 Groups & Teams Formal Groups created by managerscreated by managers Cross- Cultural Teams Top Mgmt. Teams R & D Teams Self-Self- Managed Teams Command Groups Task Forces Informal Groups created by workerscreated by workers Friendship Groups. Figure 14. 14 — 7 Irwin/Mc. Graw-Hill ©The Mc. Graw-Hill Companies, Inc. , 2000 Formal Groups & Teams Created by manager to meet the firm’s goals. Cross-functional: members of different departments. Cross-cultural: members of different cultures. Research and Development Teams: Create new products. Top Management team: help develop firm’s direction. Important to have diversity in it to avoid group think. Command Groups: members report to same manager. Task Force: created to meet a given objective. Standing committees are permanent task forces. 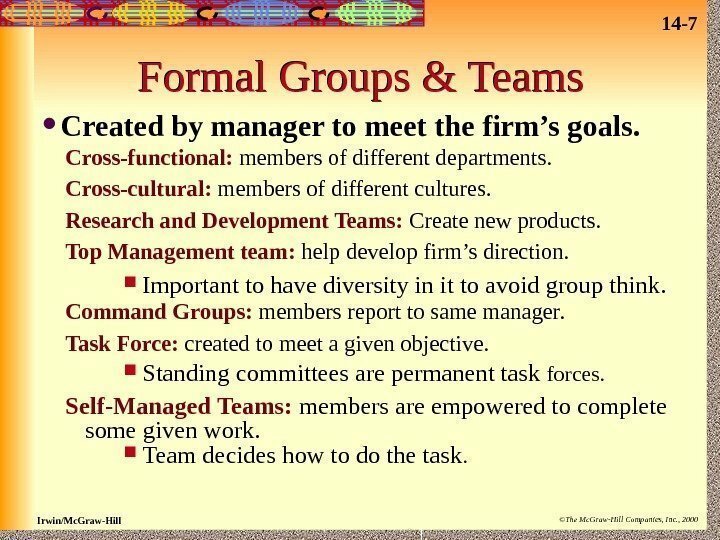 Self-Managed Teams: members are empowered to complete some given work. Team decides how to do the task. 14 — 8 Irwin/Mc. Graw-Hill ©The Mc. 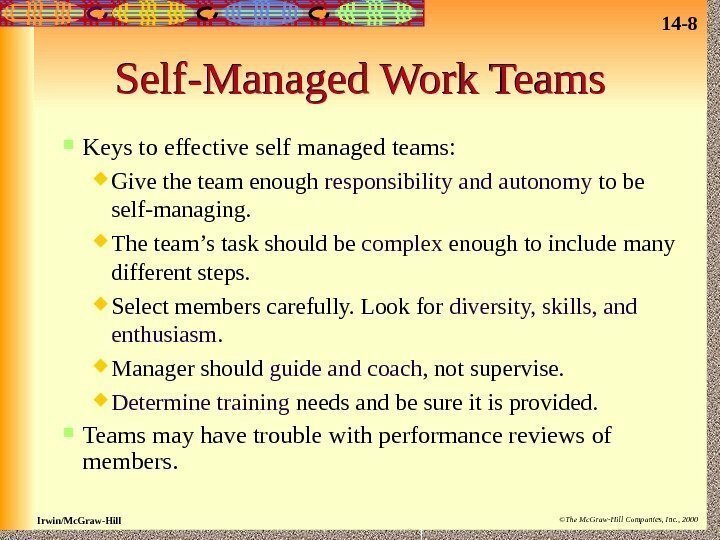 Graw-Hill Companies, Inc. , 2000 Self-Managed Work Teams Keys to effective self managed teams: Give the team enough responsibility and autonomy to be self-managing. The team’s task should be complex enough to include many different steps. Select members carefully. Look for diversity, skills, and enthusiasm. Manager should guide and coach , not supervise. Determine training needs and be sure it is provided. Teams may have trouble with performance reviews of members. 14 — 9 Irwin/Mc. Graw-Hill ©The Mc. 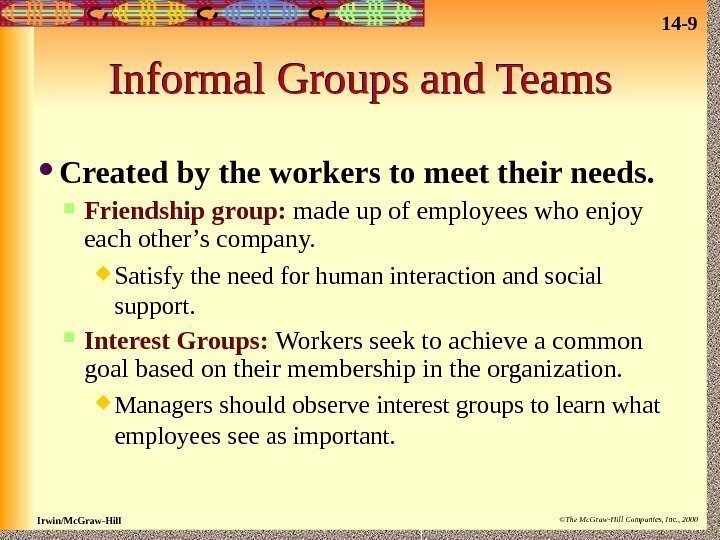 Graw-Hill Companies, Inc. , 2000 Informal Groups and Teams Created by the workers to meet their needs. Friendship group: made up of employees who enjoy each other’s company. Satisfy the need for human interaction and social support. Interest Groups: Workers seek to achieve a common goal based on their membership in the organization. Managers should observe interest groups to learn what employees see as important. 14 — 10 Irwin/Mc. Graw-Hill ©The Mc. 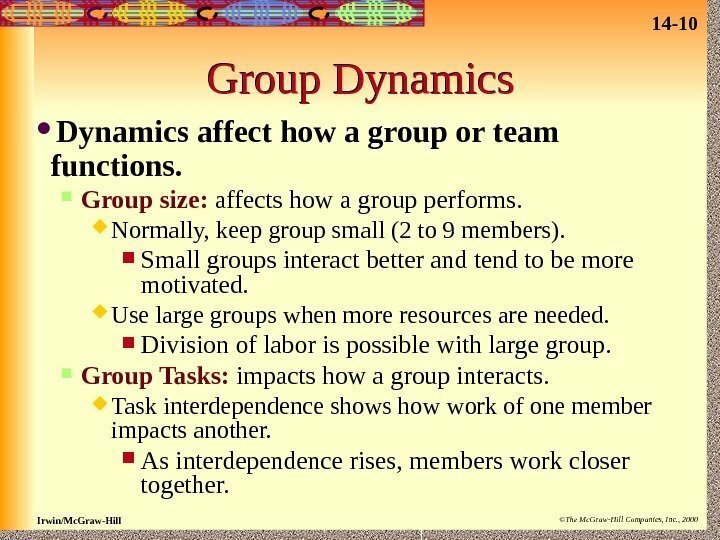 Graw-Hill Companies, Inc. , 2000 Group Dynamics affect how a group or team functions. 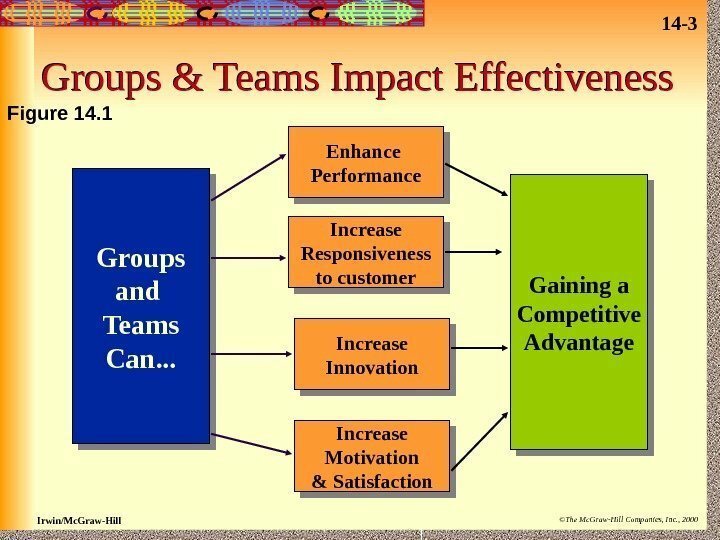 Group size: affects how a group performs. Normally, keep group small (2 to 9 members). Small groups interact better and tend to be more motivated. Use large groups when more resources are needed. Division of labor is possible with large group. 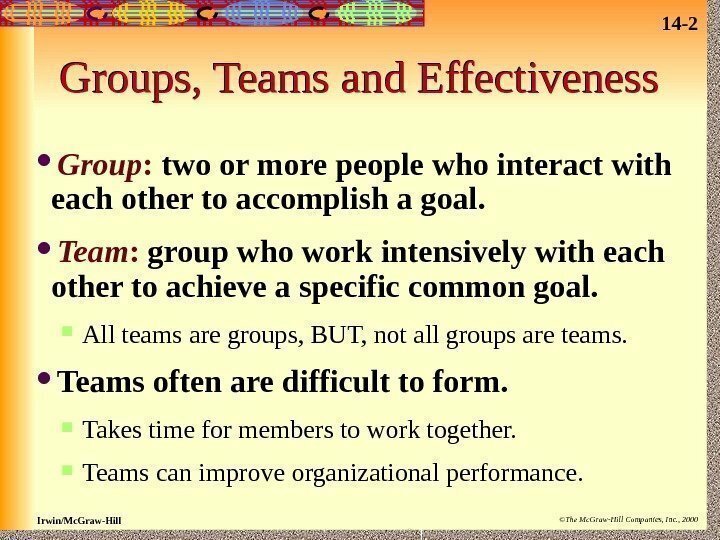 Group Tasks: impacts how a group interacts. Task interdependence shows how work of one member impacts another. As interdependence rises, members work closer together. 14 — 11 Irwin/Mc. Graw-Hill ©The Mc. 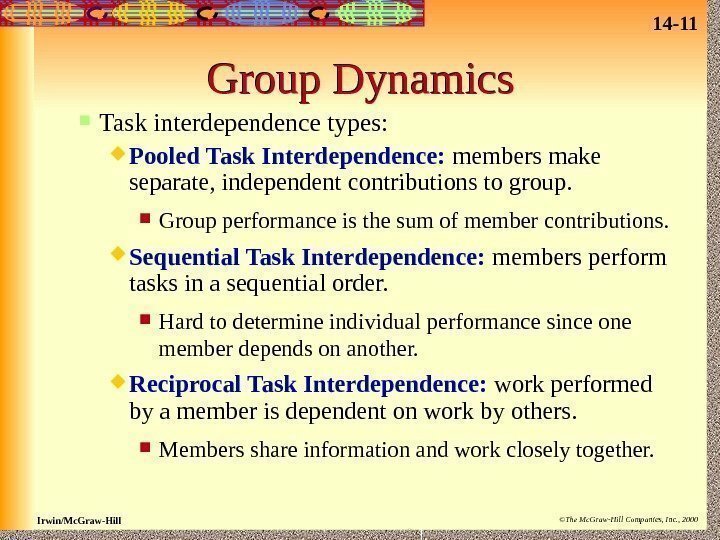 Graw-Hill Companies, Inc. , 2000 Group Dynamics Task interdependence types: Pooled Task Interdependence: members make separate, independent contributions to group. Group performance is the sum of member contributions. Sequential Task Interdependence: members perform tasks in a sequential order. Hard to determine individual performance since one member depends on another. Reciprocal Task Interdependence: work performed by a member is dependent on work by others. Members share information and work closely together. 14 — 12 Irwin/Mc. Graw-Hill ©The Mc. 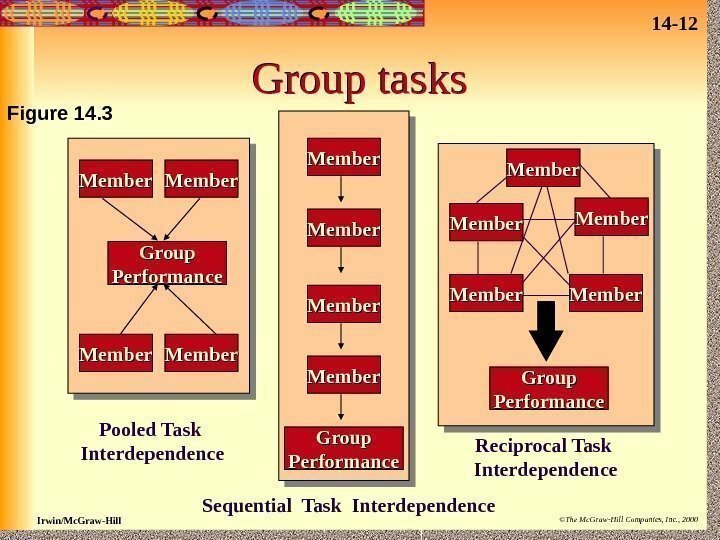 Graw-Hill Companies, Inc. , 2000 Group tasks Sequential Task Interdependence. Member. Group Performance Member Group Performance. Pooled Task Interdependence Member Member Group Performance Reciprocal Task Interdependence. Figure 14. 14 — 13 Irwin/Mc. Graw-Hill ©The Mc. 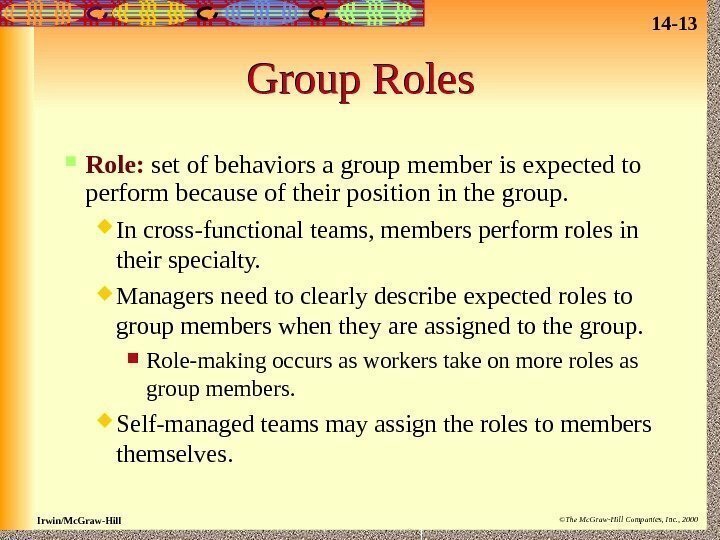 Graw-Hill Companies, Inc. , 2000 Group Roles Role: set of behaviors a group member is expected to perform because of their position in the group. In cross-functional teams, members perform roles in their specialty. Managers need to clearly describe expected roles to group members when they are assigned to the group. Role-making occurs as workers take on more roles as group members. Self-managed teams may assign the roles to members themselves. 14 — 14 Irwin/Mc. Graw-Hill ©The Mc. 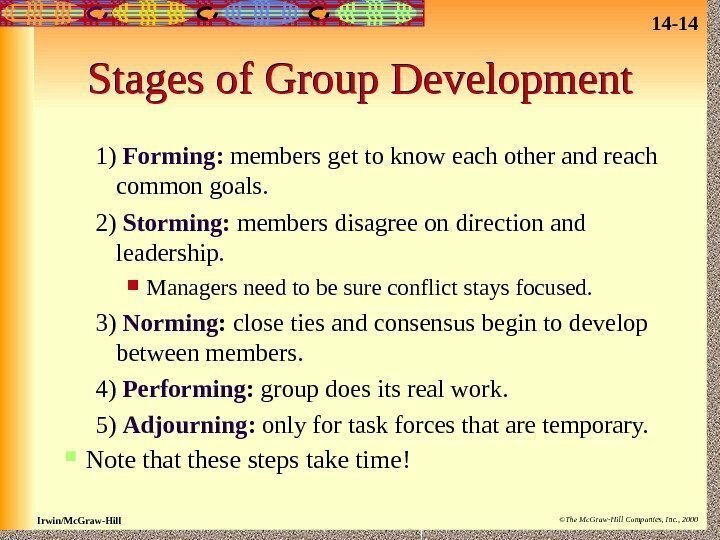 Graw-Hill Companies, Inc. , 2000 Stages of Group Development 1) Forming: members get to know each other and reach common goals. 2) Storming: members disagree on direction and leadership. Managers need to be sure conflict stays focused. 3) Norming : close ties and consensus begin to develop between members. 4) Performing : group does its real work. 5) Adjourning: only for task forces that are temporary. Note that these steps take time! 14 — 15 Irwin/Mc. Graw-Hill ©The Mc. 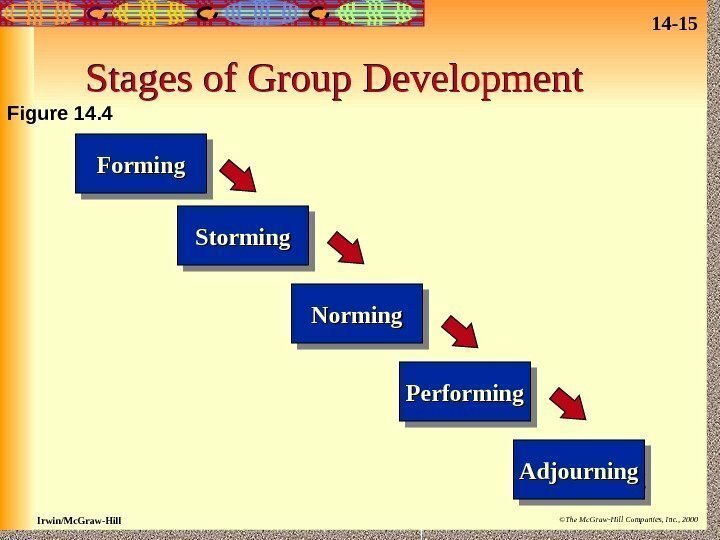 Graw-Hill Companies, Inc. , 2000 Stages of Group Development Performing Adjourning. Norming. Storming. Forming. Figure 14. 14 — 16 Irwin/Mc. Graw-Hill ©The Mc. 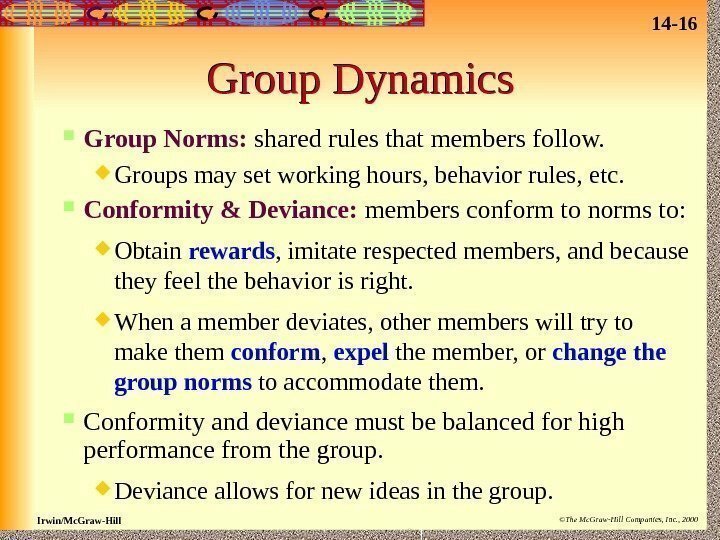 Graw-Hill Companies, Inc. , 2000 Group Dynamics Group Norms: shared rules that members follow. Groups may set working hours, behavior rules, etc. Conformity & Deviance: members conform to norms to: Obtain rewards , imitate respected members, and because they feel the behavior is right. When a member deviates, other members will try to make them conform , expel the member, or change the group norms to accommodate them. 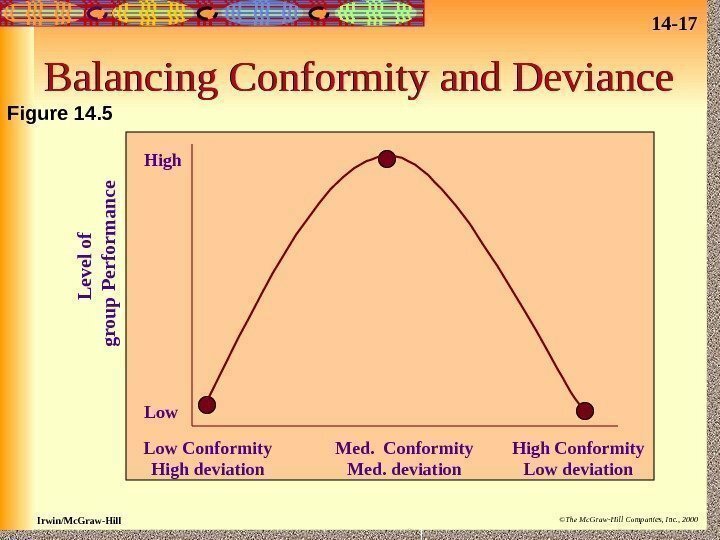 Conformity and deviance must be balanced for high performance from the group. Deviance allows for new ideas in the group. 14 — 18 Irwin/Mc. Graw-Hill ©The Mc. 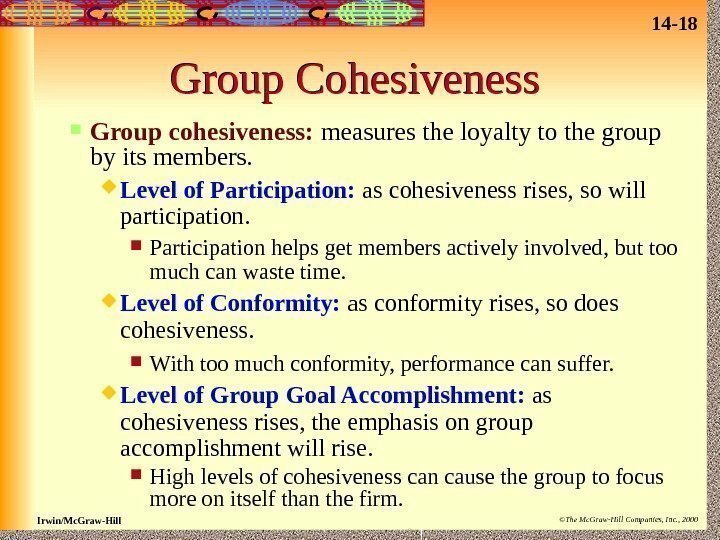 Graw-Hill Companies, Inc. , 2000 Group Cohesiveness Group cohesiveness: measures the loyalty to the group by its members. Level of Participation: as cohesiveness rises, so will participation. Participation helps get members actively involved, but too much can waste time. Level of Conformity: as conformity rises, so does cohesiveness. With too much conformity, performance can suffer. 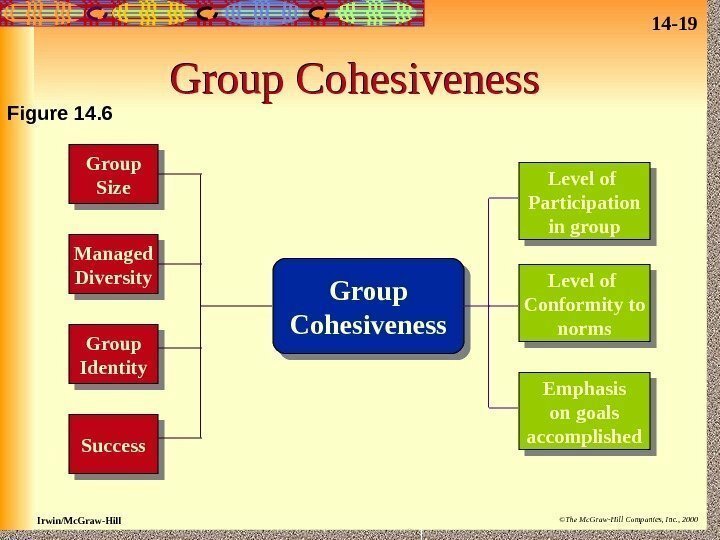 Level of Group Goal Accomplishment: as cohesiveness rises, the emphasis on group accomplishment will rise. 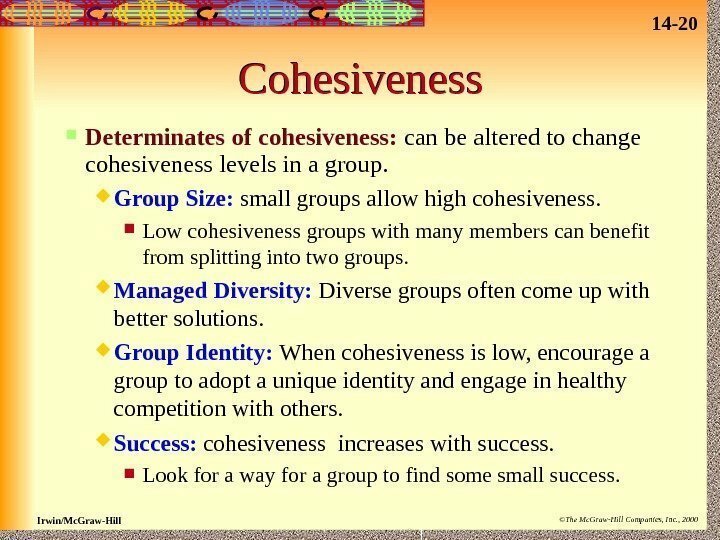 High levels of cohesiveness can cause the group to focus more on itself than the firm. 14 — 19 Irwin/Mc. Graw-Hill ©The Mc. Graw-Hill Companies, Inc. , 2000 Group Cohesiveness Group Size Managed Diversity Group Identity Success Group Cohesiveness Level of Conformity to norms. Level of Participation in group Emphasis on goals accomplished. Figure 14. 14 — 20 Irwin/Mc. Graw-Hill ©The Mc. Graw-Hill Companies, Inc. , 2000 Cohesiveness Determinates of cohesiveness: can be altered to change cohesiveness levels in a group. 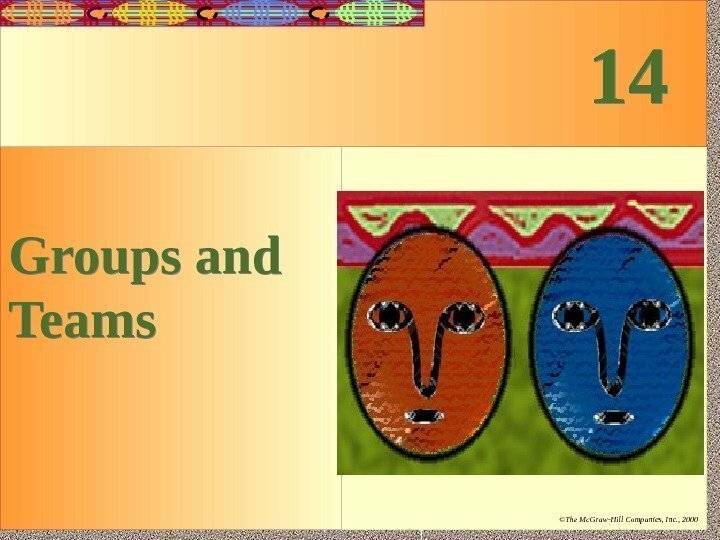 Group Size: small groups allow high cohesiveness. Low cohesiveness groups with many members can benefit from splitting into two groups. Managed Diversity: Diverse groups often come up with better solutions. Group Identity: When cohesiveness is low, encourage a group to adopt a unique identity and engage in healthy competition with others. Success: cohesiveness increases with success. Look for a way for a group to find some small success. 14 — 21 Irwin/Mc. Graw-Hill ©The Mc. Graw-Hill Companies, Inc. , 2000 Reducing Social Loafing Make individual contributions identifiable Emphasize valuable individual contributions Keep group size at an appropriate level REDUCEREDUCE Social Loafing. Figure 14. 14 — 22 Irwin/Mc. Graw-Hill ©The Mc. 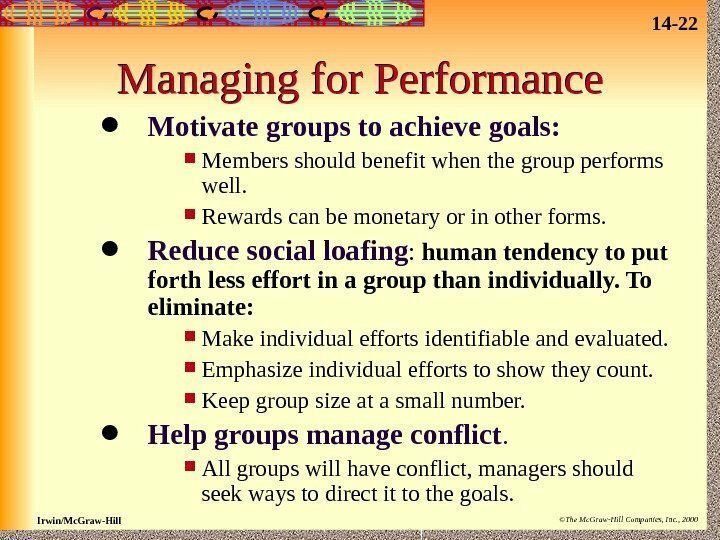 Graw-Hill Companies, Inc. , 2000 Managing for Performance Motivate groups to achieve goals: Members should benefit when the group performs well. Rewards can be monetary or in other forms. 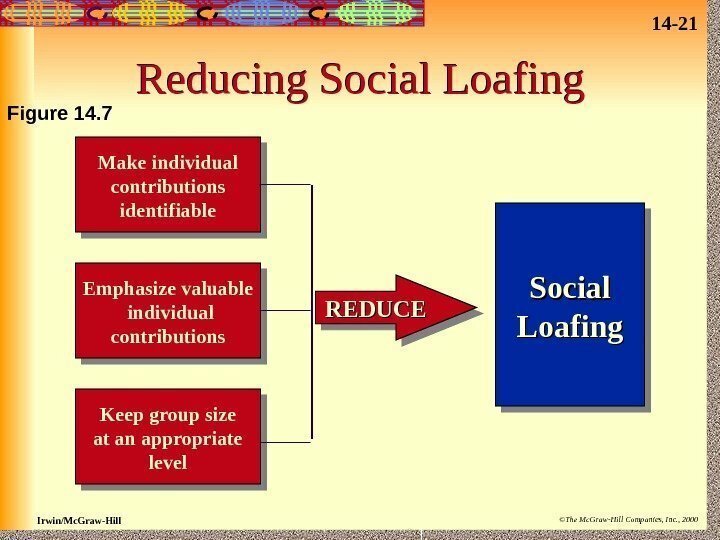 Reduce social loafing : human tendency to put forth less effort in a group than individually. To eliminate: Make individual efforts identifiable and evaluated. Emphasize individual efforts to show they count. Keep group size at a small number. Help groups manage conflict. All groups will have conflict, managers should seek ways to direct it to the goals.